The lovely Melinda has been busy making up some more samples for the shop. If you come into the shop, or follow the blog, it is no secret that we absolutely love the Oliver + S range of children’s clothing patterns. The designs are stylish and smart, but very wearable. The Playtime Dress, Tunic and Leggings pattern is a great example of this. It looks really comfortable and easy to wear, and we thought it is very suitable for the changeable Spring weather. The dress or tunic can be made in woven fabrics, such as quilting cotton and linen, however we went with the jersey option. 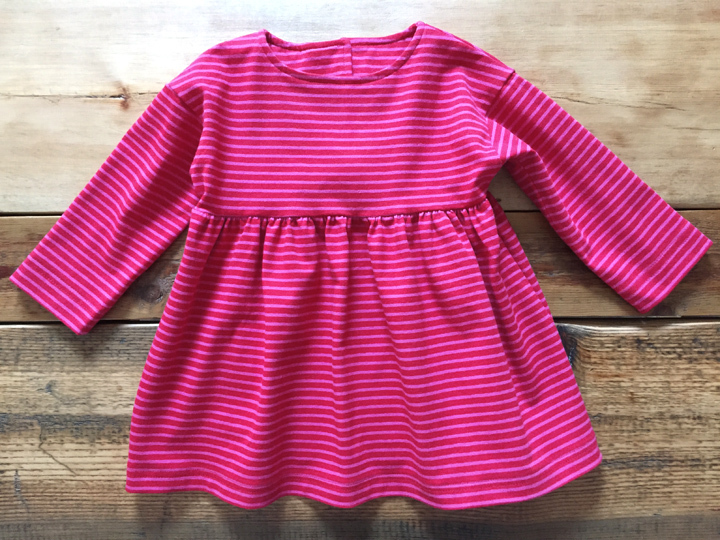 The fabric we used was the Little Darling stripe in red and pink. As the top was a stripe fabric, we decided to have some fun with the leggings, and used our funky birds fabric. Both fabrics are 95% cotton/5% spandex. Please note, when using any knit fabric we recommend pre-washing it before use. The first thing we thought about the pattern is that it is a very good buy. You get three items of clothing from it, and they are easy to adapt to where they are to be worn. For example, our version uses jersey and so is suitable for wearing at weekends (or to nursery for younger children), but a woven dress with the optional mock Peter Pan collar would be smart enough for an event. The pattern was quick and easy to make up, however it has been graded by Oliver + S as being a level 2 (of 4). The main aspect we think can be a little tricky is sewing with knit fabric, so remember to use a ballpoint needle and the correct stitch settings on your sewing machine. 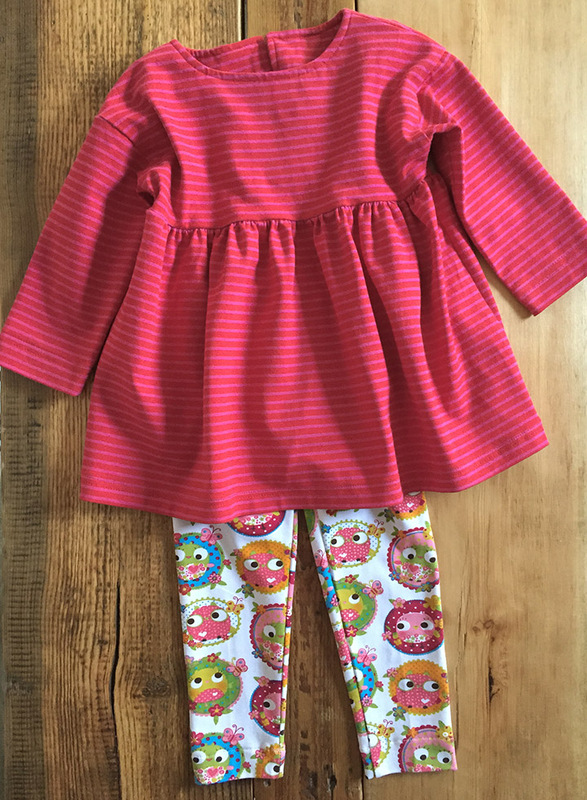 The pattern comes in two sizes: 6m to 4 years, and age 5 to 12. It is £14.95, and available from our website here.